PRODUCT: 1/8 x .375 - 0.500" (3/8 - 1/2") GRIP, ALL STAINLESS STEEL BODY/MANDREL, BUTTON HEAD (OPEN/DOME), BLIND POP RIVETS. PRICE/100. 304 STAINLESS STEEL BODY / MANDREL. 1/8 x .375 - 0.500 INCH (3/8 - 1/2 In.) 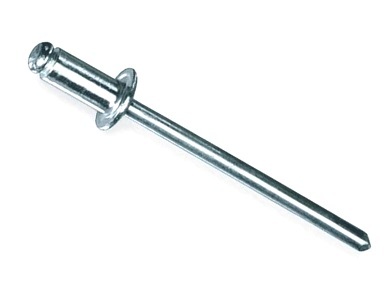 GRIP, ALL STAINLESS STEEL BODY/MANDREL, BUTTON HEAD (OPEN/DOME), BLIND POP RIVETS. 10,000/BOX. PRICE/BOX. BLIND RIVET TOOL (POP/CLICK RIVET TOOL). Forged Aluminum Body. Sets 1/8, 5/32, and 3/16 in. aluminum rivets and 1/8 in. stainless steel rivets. Includes 4 nose pieces. Price/Tool. MARSON HP-2 (39000) PROFESSIONAL RIVET TOOL. SETS 3/16 in. DIAMETER RIVENTS IN 1/8 in. to 5/8 in. THICKNESS MATERIALS. Price/Tool.